As an Atlanta wholesale supplier, we provide custom-printed paper and custom plastic bags to many small businesses, medium businesses, retail stores, manufacturers, food producers and other companies. Economical and recyclable, custom plastic bags (poly bags) are widely used in retail stores, production environments, trade shows, manufacturing, food processing and storage, and more. Available in many styles and colors, plastic bags can be custom printed with your design, logo, promotional message, etc. 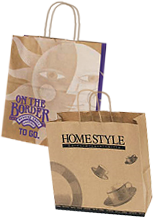 Custom-printed paper shopping bags are made from a renewable resource and are recyclable. Some are made from partially-recycled material and some are 100% recycled and are manufactured by FSC Suppliers. Standard sizes and colors can be overprinted with ink (post printed) or foil (hot stamped). Custom made or made-to-order bags can be almost any size and allow more creative, flexible designs and printing. With your logo and message, they’re a great way to reinforce your company’s brand as they’re often kept and reused over and over. Reusable shopping bags and promotional non-woven tote bags are a green, eco-friendly option that is affordable, attractive and durable. Customize your reusable bags by printing your message and logo — great for brand recognition. Your customers will appreciate this paper bag/plastic bag alternative.